Carlow manager Colm Bonnar believes his side cannot be written off ahead of their All-Ireland SHC preliminary quarter-final date with Limerick next weekend, following their win at Croke Park yesterday. The Barrowsiders maintained their impressive 2018 form with a five-point victory over Westmeath, ensuring they will compete in the 2019 Leinster SHC at the expense of relegated Offaly. Goals either side of half-time from James Doyle and Chris Nolan set Carlow on their way, with free-taker Denis Murphy nailing 10 dead balls in total to tee up a date against Limerick at Netwatch Cullen Park next weekend. While Westmeath face a difficult task in rebuilding ahead of Wexford's visit to Mullingar, Bonnar is confident that his side have precious momentum following their second 'promotion' this season - following a jump up from Division 2A of the National League earlier in the year. 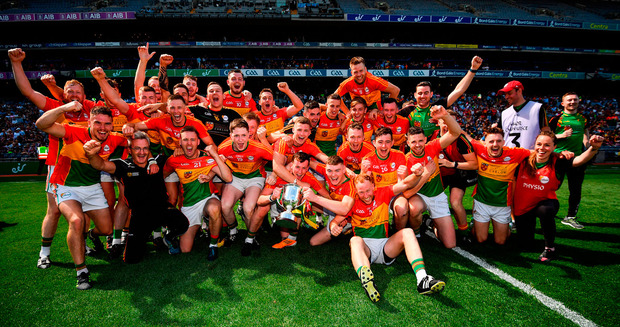 "The performances over the last two years have shown that Carlow are on their way up," said Bonnar. "This is the end of maybe two years of hard work, but, having said that, it's only the start of a new horizon because where we're going up to Division 1B and up to senior is going to be massive in terms of what we need to do, so onwards and upwards. "It's a huge test for us (against Limerick). They'll be looking to push us aside very quickly, but we're fighting for respect and we need to be able to stand up to that. It will be in Netwatch Cullen Park and you can never write off this team." Based on this win, free-scoring Carlow certainly cannot be written off easily. Denis Murphy topped the charts, hitting 10 points, all from dead balls, but all six of their forwards and eight players in all got on the scoreboard. The most significant scores were their goals either side of half-time, as James Doyle and Chris Nolan set Carlow on their way. In the fourth clash between the sides this season, Westmeath's early shooting was wayward, as they clocked up 10 wides by the 25th minute. They had drawn level by the 32nd minute via a free from the reliable Allan Devine, but a missed goal chance would prove costly as Aonghus Clarke fired a point over. Carlow responded by raising a green flag at the end of the resulting play as their puck-out made its way to Doyle, who goaled for a two-point half-time lead - 1-12 to 0-13 - when they could easily have been trailing. Nolan - impressive throughout - found the net from a Doyle lay-off less than a minute after the break and a quickfire point from wing-back Kevin McDonald put Carlow six points up. While Devine's free-taking and the trojan efforts of Eoin Price kept Westmeath in touch, they could not close the gap, before Derek McNicholas picked up a second booking and Niall O'Brien hit a late consolation goal. 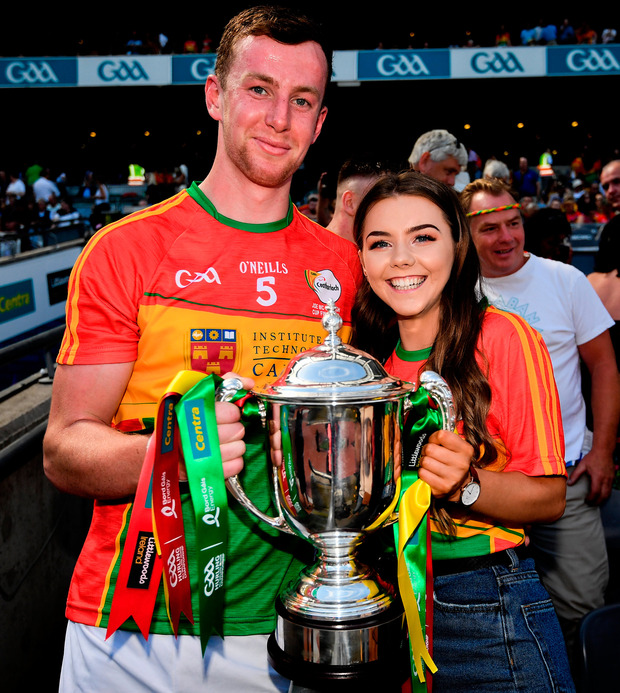 A magnanimous Michael Ryan, who highlighted Carlow's first goal as a "huge blow", said: "Overall, from start to finish, we were never really at the pitch of it. "We missed a few chances early on and it seemed to drain a bit of the confidence. But let's be straight, the best team won," added Ryan, who will now hope to revive his troops for Wexford's visit to Mullingar next weekend. Carlow - B Tracey 7; A Corcoran 6, P Doyle 7, M Doyle 6; K McDonald 8, R Coady 7, D English 7; J Kavanagh 6, D Byrne 7; JM Nolan 8, P Coady 8, E Byrne 7; J Doyle 8, D Murphy 8, C Nolan 9. Subs: R Smithers 6 for D Byrne 66, S Murphy 6 for E Byrne 67, R Kelly for J Kavanagh 69, J Murphy for P Coady 71, T Joyce for C Nolan 72.